OpenEXR is the visual effects industry-standard floating point file format and the best format to use when working with 32-bit HDR imagery. Access all the capabilities of OpenEXR from within Adobe Photoshop, After Effects, and Premiere Pro using ProEXR. OpenEXR can support multiple layers of imagery, but Photoshop can't read or save layered EXR files...unless you have ProEXR. 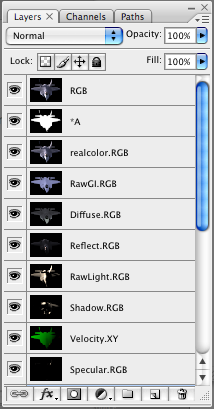 Store all your layers in one file and read them into After Effects, Nuke, Shake, and Fusion. Or in one step save layers as individual files for programs that are less EXR savvy. ProEXR will also read all the image buffers created by modern 3D renderers and place each in its own Photoshop layer. 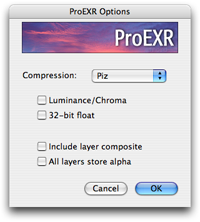 ProEXR lets you choose from all the compression options available in OpenEXR. Most EXR compression is lossless, but one of the most interesting options is a lossy method similar to JPEG, applied to the world of floating point. Using B44 compression and Luminance/Chroma sampling, HDR images can be crushed to a fraction of their uncompressed size, usually without visible artifacts, only in ProEXR. Layered EXR output from an After Effects comp. Retention of EXR color space information. Support for both 32-bit and 16-bit floating point. Full control over alpha channel processing. Automatic EXR project set-up in After Effects and Nuke. Built with the latest OpenEXR libraries. Free, open source After Effects plug-ins for working with OpenEXR files and 3D Channels. Free, open source OpenEXR file support for Adobe Premiere Pro. ProEXR exposes all the options in OpenEXR. Automatic project set-up in After Effects.